This is a non-normative document intended to provide an easily readable technical background on the Efficient XML Interchange (EXI) format. It is oriented towards quickly understanding how the EXI format can be used in practice and how options can be set to achieve specific needs. Section 2. Concepts describes the structure and content of an EXI document and introduces the notions of EXI header, EXI body, and EXI grammar which are fundamental to the understanding of the EXI format. Furthermore, additional details about data type representation, compression, and their interaction with other format features are presented. Finally, Section 3. Efficient XML Interchange by Example provides a detailed, bit-level description of both, a schema-less and a schema-informed example. This document has been produced by the Efficient XML Interchange Working Group as part of the W3C XML Activity. The goals of the Efficient XML Interchange (EXI) Format are discussed in the Efficient XML Interchange (EXI) Format document. The authors of this document are the members of the Efficient XML Interchange Working Group. Please send comments about this document to the public-exi@w3.org mailing list (Archives). The intended audience of this document includes users and developers of EXI with a basic understanding of XML and XML Schema. This document provides an informal description of the EXI format; the reader is referred to the [Efficient XML Interchange (EXI) Format 1.0] document for further details. Hereinafter, the presentation assumes that the reader is familiar with the basic concepts of XML and the way XML Schema can be used to describe and enforce constraints on XML documents. The document is comprised of two major parts. The first part describes the structure and content of an EXI document with and without compression. More specifically, it describes the concept of an EXI stream and how it is generated using EXI grammars, as well as the implications on structure and content ordering in an EXI stream when compression is enabled. As a practical application of the concepts from the first part, the second part presents a complete bit-level description of an EXI document. The development of the Efficient XML Interchange (EXI) format was guided by five design principles , namely, the format had to be general, minimal, efficient, flexible, and interoperable. The format satisfies these prerequisites, achieving generality, efficiency, and flexibility while at the same time keeping complexity in check. Many of the concepts employed by the EXI format are applicable to the encoding of arbitrary languages that can be described by a grammar. Even though EXI utilizes schema information to improve compactness and processing efficiency, it does not depend on accurate, complete, or current schemas to work. EXI represents the contents of an XML document as an EXI stream. As shown below, an EXI stream consists of an EXI header followed by an EXI body. The EXI header conveys format version information and may also include the set of options that were used during encoding. If these options are omitted, it is assumed that the decoder has access to them out of band. The EXI body comprises an event sequence describing the document (or document fragment) that is encoded. The following two sections describe the EXI header and EXI body in more detail. The header communicates encoding properties that are needed to decode the EXI body. The minimal header can be represented in a single byte. This keeps the overhead and complexity to a minimum and does not sacrifice compactness, especially for small documents where a header can introduce a large constant factor. The structure of an EXI header is depicted in the following figure. The EXI header starts with an optional four-byte EXI Cookie. The four byte field consists of four characters " $ " , " E ", " X " and " I " in that order, each represented as an ASCII octet, that can be used to distinguish an EXI stream from a broad range of data streams. The EXI Cookie is followed by a pair of Distinguishing Bits. The two bit-sequence (1 0) can be used to distinguish an EXI document from a textual XML document and is sufficient to distinguish EXI streams from XML streams based on a broad range of character encodings. The Presence Bit for EXI Options follows the distinguishing bits. The value of this single bit is used to indicate the presence or absence of the EXI Options that appear later in the header. The EXI Format Version identifies the version of EXI in use and allows future improvements and modifications. A leading 0 (zero) bit indicates that the document is encoded according to the final version of the recommendation, while a leading 1 (one) indicates that it is a preview version. The differentiation is introduced to facilitate early releases of preview versions with less strict interoperability requirements. Only final versions are required to be processed by compliant processors. The leading bit is followed by one or more 4-bit sequences which are collectively interpreted as a format version number starting at 1. For example, the 4-bit sequence 0000 is interpreted as version 1 and the two 4-bit sequences 1111 0001 are interpreted as 15 + 2 or version 17. The EXI Options specify how the body of an EXI stream is encoded and, as stated earlier, their presence is controlled by the presence bit earlier in the header. The overhead introduced by the EXI options is comparatively small given that they are formally described using an XML schema and are encoded using EXI as well. The following table describes the EXI options that can be specified in the EXI header. When the EXI Options document does not specify a value for a particular option, the default value is assumed. Most of the options are straightforward and act as boolean values to enable or disable a feature. They are represented using optional XML elements which are also encoded using EXI. For more information on the XML schema that is used to encode these options, the reader is referred to XML Schema for EXI Options Header. The preserve options shown in the table above are really a family of options that control which XML items are preserved and which XML items are ignored. These are collectively known as fidelity options. These options can be used to eliminate the associated overhead of communicating unused XML items. Certain XML items such as processing instructions or DTDs may never occur (like in SOAP) or are simply unimportant to the use case or application domain. Fidelity options are used to manage filters for certain XML items as shown in the following table. Naturally, XML items that are discarded at encoding time (due to a particular setting of the fidelity options) cannot be reconstructed exactly at decoding time. The next section deals with the EXI Body and discusses in more detail the effects of enabling and disabling fidelity options. The body of an EXI document is composed of a sequence of EXI events. The notion of an event in this context is similar to that in the StAX and SAX APIs. XML items are encoded into one or more EXI events; for example, an attribute named foo can be encoded as AT("foo") and an element named bar as the pair of events SE("bar") and EE. EXI events may have additional content associated with them. For example, the attribute event AT("foo") may have an attribute value foo1 associated with it. The following table shows all the possible event types together with their associated information items distinguished by structure and content. In EXI terminology, content denotes attribute and character values while all other information items are considered as belonging to the structure category. ¹EXI Options such as preserve and selfContained can be used to prune events from the EXI stream to realize a more compact representation. For named XML items, such as elements and attributes, there are three types of events: SE(qname), SE(uri:*) and SE(*) as well as AT(qname), AT(uri:*) and AT(*). These events differ in their associated structure: when SE(qname) or AT(qname) are used, the actual qname of the XML item is not encoded as part of the event while SE(uri:*) and AT(uri:*) events do not encode the uri. The decision to use one type of event over the other will be explained later after introducing the notion of EXI grammars. Additionally, Fidelity Options may allow the preservation of namespace prefixes. The fidelity options introduced in Section 2.1.1 EXI Header may be used to prune EXI events such as Namespace Declaration (NS), Comment (CM), Processing Instruction (PI), DOCTYPE (DT) or Entity Reference (ER). Grammar pruning simplifies the encoding and decoding process and also improves compactness by filtering out unused event types. The sequence of EXI events corresponding to the body of this XML document is shown below. This sequence of EXI events can be easily mapped to the structure of the XML document shown above. Every document begins with a Start Document (SD) and ends with an End Document (ED). The order in which attributes are encoded may be different in schema-less and schema-informed EXI streams, as is the exact content associated with each event. The actual number of bits used to represent each type of event, excluding its content, differs depending on the context. The more event types can occur in a certain context, the larger the number of bits required to represent an event in that context. What constitutes a context in this case is more formally defined by an EXI grammar production in the next section. EXI is a knowledge based encoding that uses a set of grammars to determine which events are most likely to occur at any given point in an EXI stream and encodes the most likely alternatives in fewer bits. It does this by mapping the stream of events to a lower entropy set of representative values and encoding those values using a set of simple variable length codes or an EXI compression algorithm. EXI grammars are regular grammars in which productions are associated with event codes. 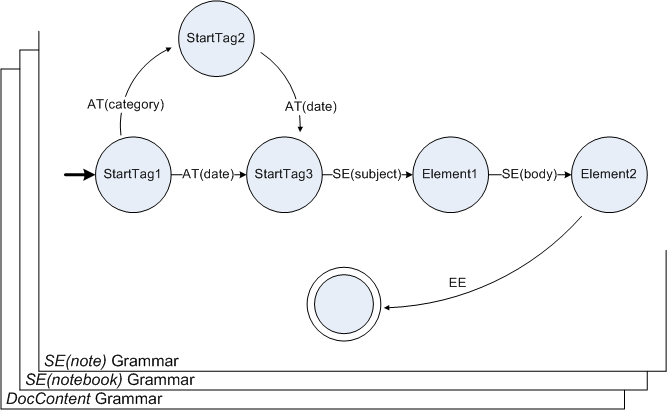 An EXI encoder, driven by an XML event stream, matches events to grammar productions and uses their associated event codes to represent an XML document or XML fragment. Since EXI grammars are regular grammars, the sequence of event codes written by an encoder corresponds to a path in the finite automaton that accepts the grammar. In reality, given that XML is not a regular language, a single grammar cannot be used to represent an entire XML event stream. Instead, an EXI encoder uses a stack of grammars, one for each element content model (just like an XML Schema validator might do). An event code is represented by a sequence of one to three parts, where each part is a non-negative integer. Event codes in an EXI grammar are assigned to productions in such a way that shorter event codes are used to represent productions that are more likely to occur. Conversely, longer event codes are used to represent productions that are less likely to occur. EXI grammars are designed in a way that the average number of bits needed to represent each production is less than that for a grammar in which more likely and less likely productions are not distinguished. The following tables illustrate this principle via an example. In the first table, where productions are not separated according to their probability, a 4-bit code is needed to represent each entry. In the second table, on the other hand, code lengths vary from 2 bits to 6 bits since productions are grouped based on their likelihood to occur. Assuming the content model for the element being encoded corresponds to the sequence AT(category) AT(date) (i.e., the element declares two attributes) then the encoding of all the event codes will be 4 bits shorter using the second table. EXI grammars take advantage of a priori knowledge of the kind of data being encoded, namely, XML documents and XML fragments. In particular, EXI grammars can take advantage of the fact that, on any given grammar, certain XML items are more popular than others. For example, by simple inspection of real-world documents, it is easy to verify that attributes occur more frequently than processing instructions and should therefore receive shorter event codes. Further improvements in grammar design are possible if schema information is available. In this case, we can not only take advantage of generic XML knowledge but also of knowledge that is specific to the type of documents being encoded. For example, as shown in the tables above, we can add specific productions such as AT(category) and AT(date) with shorter event codes than AT(*). The following two sections describe the differences between the built-in grammars and the schema-informed grammars. Note that an EXI encoder may only have partial schema information in which case it will use a combination of built-in and schema-informed grammars during encoding. EXI uses a set of built-in grammars to encode XML documents and XML fragments when no schema information is available. There are built-in grammars to encode documents, fragments, and elements. Document grammars and fragment grammars describe the top-level structure, while element grammars describe the structure of every element. Fragment grammars are more lenient than document grammars; for example, they allow multiple top-level elements to be encoded as siblings. For more information on these grammars, the reader is referred to Built-in XML Grammars. The EXI format describes a mechanism by which built-in grammars are dynamically extended using information from the actual instance being encoded. Stated differently, the EXI format describes a learning mechanism to further improve efficiency when no schema information is available statically. Newly learned productions are assigned short event codes, improving compactness for every subsequent use of those productions. In addition, by adding new productions to the grammar, certain data associated with an event only needs to be encoded once. For example, if an element named notebook is matched by SE(*) and subsequently matched by SE(notebook), the actual localName "notebook" is only encoded once as part of the SE(*) event. As pointed out in the previous section, EXI grammars are always regular and can, therefore, be accepted by finite automata (FA). To provide a more operational view of an EXI processor, we will opt for the use of FA to explain how grammars work. The following figure shows a stack of grammars in which the top-level grammar accepts "note" elements. State transitions in black correspond to the built-in element grammar; state transitions in red have been learned as a result of encoding the element before. The built-in element automaton has two distinguished states: StartTag and Element. The former accepts attribute and namespace events that must occur before any element content; the latter accepts only element content which excludes attribute and namespace events. This separation enables the use of short codes which improves compactness and processing time. As stated earlier, transitions in red are extensions to the built-in element grammar based on knowledge acquired about the element note. Notice how AT(date), AT(category) and SE(subject) have been added out of the StartTag state while SE(body) has been added out of the Element state. In particular, this suggests that SE(subject) is expected to occur before SE(body), and that both of these SE events are expected to occur after any AT event. In addition, notice that both AT(*) and SE(*) are still available to enable future learning. EXI grammars can be further improved if schema information is known statically. Schema information can be interpreted in two different ways or encoding modes: strict and non-strict. In strict mode, the instances being encoded must be largely valid with respect to the schema; most deviations from the schema will result in an encoding error. In non-strict mode, any deviations are accepted and encoded using more generic events. Examples of deviations are attributes whose actual values do not match the type defined in the schema or elements whose structure does not correspond to that in the schema. Given that strict grammars have fewer productions (no need for SE(*) or AT(*) in most cases) shorter event codes can be used to encode each option. Instead of being dynamically extensible as the built-in grammars, schema-informed grammars are created statically based on the information in the available schema. This process will add productions of the form AT(qname) or SE(qname) guided by the attribute and element declarations in the schema. Let us continue the example from the previous section by assuming the following schema is available statically. 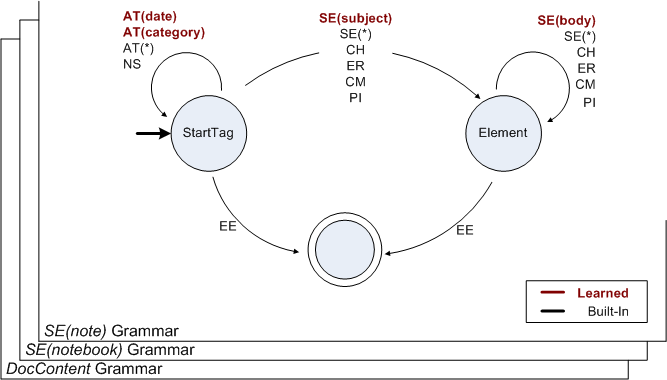 The schema for the element note states that it has a mandatory attribute date and an optional attribute category, and that its structure is composed of an element subject followed by an element body. An automaton that corresponds to the strict grammar for this element is shown next. Note that AT(category) is accepted before AT(date) even though their order is reversed in the schema. This is because attributes in schema-informed grammars must be sorted lexicographically, first by local name and then by namespace URI. Attribute sorting reduces the number of options which, in turn, greatly simplifies grammar creation and improves compactness. Since this automaton does not include transitions on AT(*) or SE(*), any deviations from the schema will result in an encoding error. Generally speaking, schema-informed grammars should be favored over built-in grammars. Schema knowledge characterizes constraints of the structure and content type of XML information items. Hence schema-informed grammars do not evolve while processing and value items such as characters and attribute values are encoded according to their types. As a consequence, processing speed increases and compaction is improved. EXI uses built-in datatype representations to represent so called content value items in an efficient manner. In other words, all attribute and character values are encoded according to their EXI datatype representation associated with their XML Schema datatype. Type information can be retrieved from available schema information. The following table lists the mapping between [XML Schema Datatypes] and the Built-in Datatype Representations supported in EXI. n-bit Unsigned Integer integer with bounded range 4096 or smaller as determined by the values of minInclusive, minExclusive, maxInclusive and maxExclusive facets. Unsigned Integer nonNegativeInteger or integer with either minInclusive facet specified with a value equal to or greater than 0, or minExclusive facet specified with a value equal to or greater than -1. The built-in EXI datatype QName is used for structure coding, such as qualified names for XML elements and attributes. Enumerated values are efficiently encoded as n-bit Unsigned Integers where n = ⌈ log 2 m ⌉ and m is the number of items in the enumerated type. The ordinal position (starting with position zero) of each value item in the enumeration in schema-order is used as identifier. Exceptions are for schema types derived by union, QName or Notation. The values of such types are processed by their respective built-in EXI datatype representations instead of being represented as enumerations. The interested reader is referred to the Efficient XML Interchange (EXI) Format 1.0 document which describes in details the encoding rules for representing built-in EXI datatypes. When the preserve.lexicalValues option is true, all values are represented as Strings. Some values that would have otherwise been designated to certain built-in EXI datatype representations are represented as Strings with restricted character sets. In the absence of external type information (no available schema information) all attribute and character values are typed as Strings. String tables are used in memory-sensitive areas allowing a compact representation of repeated string values. Re-occurring string values are represented using an associated compact identifier rather than encoding the string literally again. When a string value is found in the string table (i.e. a string table hit) the value is encoded using a compact identifier. Only if a string value is not found in the associated table (i.e. a string table miss) is the string encoded as String and a new compact identifier is introduced. EXI puts the following four information items into string tables and partitions the string tables based on the context in which they occur. The table below shows EXI information items used in section 2.1.2 EXI Body and its relations to the string table partitions (e.g. a prefix information item is assigned to the Prefix partition while value information items are assigned to the Value partition). Each EXI string table partition is optimized for more frequent use of either compact identifiers or string literals depending on the purpose of the partition. The URI and the Prefix partitions are optimized for frequent use of compact identifiers while the LocalName and the Value partitions are optimized for frequent use of string literals . In the subsequent paragraphs, more details about the different partitions are given by making use of the previously introduced Notebook example. The Notebook XML Document example is repeated here to simplify algorithm illustrations. The uri portion of qname content items and uri content items are assigned to the URI partition. The partition is initially pre-populated with three likely entries (see figure below). 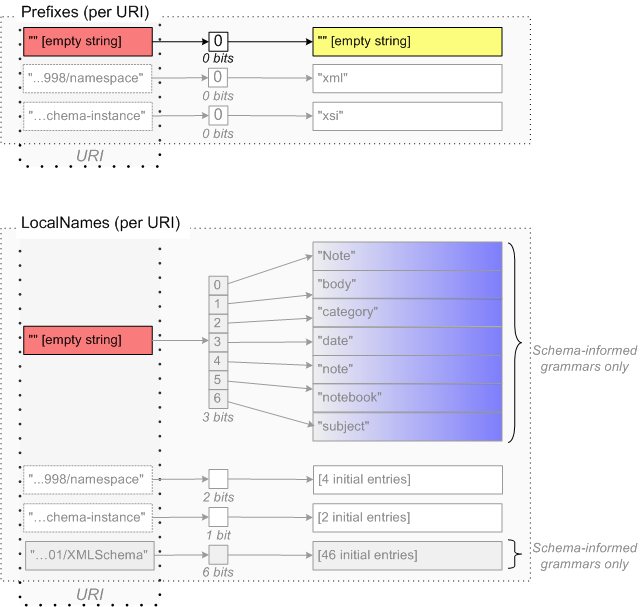 When a schema is provided, there is an additional entry that is appended and the URI partition is also pre-populated with the name of each target namespace declared in the schema, plus namespace URIs allowed in wildcard terms and attribute wildcards. The local-name portion of qname content items and local-name content items are assigned to LocalName partitions. Respectively, prefix content items are assigned to Prefix partitions. Both partition types are initially pre-populated with likely entries (see figure below). These types of partitions are further differentiated according to the associated namespace URI. In our notebook example no prefixes are used and the default namespace URI ("" [empty-string]) is used. When a schema is provided, LocalName partitions are also pre-populated with the local-name of each attribute, element and type declared in the schema, sorted lexicographically. Further local-name entries are appended in the order they appear in the actual XML instance (no additional sorting is applied). The figure above shows in highlighted form uri and local-name items used throughout the entire example document. For instance, the notebook sample assigns 7 local-name entries, such as notebook and date, to the empty URI namespace. Whenever local-name and/or uri information items occur again, the compact identifier is used instead. The last string table partition type is the Value partition. A Value partition is initially empty and grows while processing an XML instance. The total number of value items or the maximum string length of value content items can be restricted to save memory on small devices (see valuePartitionCapacity and valueMaxLength EXI Options). Attribute and Character content-values of type String are assigned to this partition. The figure above illustrates that value content items can be indexed from two different partitions, a 'global' partition and a 'local' partition. When a string value is neither found in the global nor in the local value section its string literal is encoded as String and the string value is added to both, the associated local and the global string index. In our example we assume that all value items are represented as String, as it is the case in schema-less grammars or if the fidelity option Preserve.lexicalValues is true. When a string value is found in the local value section for a given element or attribute, EXI can use the corresponding compact identifier to encode the re-appearance more efficiently. The value "2007-09-12" appears twice in the date context. The second occurrence results in a local value hit and is respectively encoded as a 1 bit compact identifier. On the other side, if a string value is not found in the local section, but is found in the global section, the corresponding global compact identifier is used. The value "EXI" appears two times in the notebook example, respectively in the context of category and subject. Hence, the second appearance results in a global value hit encoded as a 3 bit compact identifier since there are 6 entries in the global section (3 = ⌈ log 2 6 ⌉). Due to the different table sizes, a global compact identifier is generally less compact than a local compact identifier. Still, global value hits avoid the repeated encoding of string literals. The number of bits needed to encode a compact identifier depends on the actual number of entries of the associated table at that time. Since all tables are growing while parsing an XML instance, the number of bits is not fixed. The figure above illustrates the situation after coding the entire XML instance. This growth effect applies to all string table partitions and makes the format very compact for small documents. This section describes EXI String Tables at a conceptual level. The exact bit representation of table misses and indices is not presented in this document, but is described in full in the Efficient XML Interchange (EXI) Format 1.0 document. EXI can use additional computational resources to achieve higher compaction. EXI compression leverages knowledge of XML to achieve higher compression efficiency than generic compression of an EXI stream. It multiplexes an EXI stream of heterogeneous data elements into channels of more homogeneous data elements that compress better together. The mechanism used to combine homogeneous data is simple and flexible enough so that it can be used in both, schema-informed and schema-less EXI streams. Element and attribute values are grouped according to their qnames. Structure information such as Event Codes is also combined. To keep compression overhead at a minimum, smaller qname channels are combined while larger channels are compressed separately. The figure below depicts a bit-packed EXI Body Stream where no EXI compression is in use. Grey buckets represent structure information and colored buckets are used for content information. The color is determined by the associated qname (e.g. date, category, subject, body). XML instances can thus be treated as a combination of structure and content information. The content information can be further divided in different sections according to the context (surrounding structure as indicated by a qname). EXI treats XML instances this way and uses these implied partitions, referred to as channels, to provide blocked input to a standard compression algorithm. This grouping of similar data increases compression efficiency. An pre-compression phase creates a byte-aligned representation of event codes and content items that is more amenable to compression algorithms compared to unaligned representations. Most compression algorithms operate on a series of bytes to identify redundancies in the octets. By combining smaller channels into the same compressed stream while others are compressed separately, EXI keeps the compression overhead at a minimum. The mechanism to determine whether channels are combined or compressed separately is guided by the number of value content items present in the EXI stream. For small documents (≤ 100 value content items) EXI uses a single compressed stream while larger documents (> 100 value content items) result in several independent compressed streams. The notebook example falls in the first category and is encoded as a single compressed deflate stream containing first the structure channel, followed by the qname channels in the order they appear in the document (date, category, subject, body). The reader is referred to the Efficient XML Interchange (EXI) Format 1.0 document for further details. The additional task of applying EXI compression is legitimated by the fact that, in many use-cases, encoded files become over 100 times smaller than XML and up to 14 times more compact than gzipped XML. In addition, the use of computational resources to achieve higher compaction is in most cases less than that of conventional compression such as GZip (see [EXI Evaluation Note]). This section walks through the EXI coding of the Notebook Example, explaining the concepts previously introduced in a step-by-step approach. The table below shows the notation that is used in the description of EXI encoding in subsequent sections. N n An unsigned integer N is encoded as n-bit Unsigned Integer. N uint An unsigned integer N is encoded as Unsigned Integer. "Literal String" The string shown between double quotation marks is encoded as String (length prefixed sequence of characters) with the length part of the string being omitted. "Literal String" +n The string shown between double quotation marks is encoded as String (length prefixed sequence of characters) with the length part being the length of the string incremented by n.
We do not make use of specific encoding options such as using compression or user-defined datatype representations to encode the body. The table below shows the fidelity options used throughout the presented example. The fidelity options setting shown above prunes those productions in an EXI grammar that contain CM (Comment), PI (Processing Instruction), DT (DocType) or ER (Entity Reference) events. This is so as to make the grammar presentation as concise as possible, yet preserving the variety of event types that are actually used in the example XML document. In the example encodings, whitespaces that are originally present in the example XML document are omitted, which is intentional. EXI format is capable of representing those whitespaces in an efficient manner. They are omitted in the example encodings to make the encoding description more articulate by focusing on the primary data and structure without being distracted by the frequent occurrence of indentation whitespaces. This section describes the encoding of an EXI Body. The sample XML document is transcoded on the one hand into an EXI document in the absence of any schemas using built-in grammars and on the other hand using schema-informed grammars according to provided schema information (see Notebook XML Schema). While coding an EXI Body stream a stack of EXI grammars is in use. A grammar consists of an ordered list of productions. Each production (e.g. SD DocContent 0) is made up of an EXI Event, a following grammar (except for End Element), and an associated Event Code . The initial stack item is a Document or a Fragment Grammar, depending on whether we deal with an XML document or with an XML fragment, respectively. The grammar at the top of the stack represents the context and constitutes the possible productions or events of this context. In addition, Start Element (SE) events push a new grammar onto the top of the stack while End Element (EE) events pop the current grammar. Each XML information set item is split up into the according event, grammar, and encoding part accompanied with notes. The Document grammar is the starting point for any EXI document. Given that there is only one possible production SD, the associated Event Code 0 is represented in zero bits (i.e., omitted). The current Document grammar moves on to the DocContent grammar. 0 "Do not forget it!" Decoding of an EXI Body Stream is straightforward and uses as its starting point a Document Grammar or a Fragment Grammar respectively. For the sake of simplicity, the subsequent step-by-step approach shows the decoding process of a questionnaire XML document without external information such as schemas. We expect an XML document and therefore use the Built-in Document Grammar as the initial grammar. 00 SE 12 14uint "questionnaire"
00 22 SE 12 9uint "question"
00 32 CH 29uint "Is EXI ..."
0 "Is EXI difficult to decode?" Is EXI difficult to decode? 11 01 SE 12 8uint "choices"
00 22 SE 12 7uint "choice"
00 32 CH 5uint "Yes"
The resulting XML instance is shown below. The WG has crafted a tutorial page EXI 1.0 Encoding Examples that explains the workings of the EXI format using simple example documents. At the time of this writing, the page only shows a schema-less EXI encoding example.